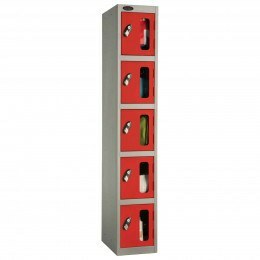 Would it assist your company's security needs to be able to view the contents of staff lockers even when they are locked? 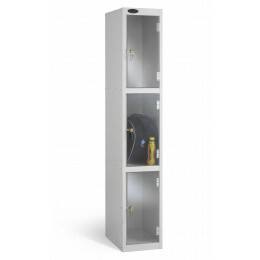 This range of Probe Polycarbonate door and Vision window lockers are the answer to improve security and reduce shrinkage. 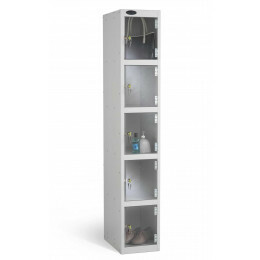 Probe Clear Vision polycarbonate door lockers and Vision Door Lockers are available with either Steel or Polycarbonate doors for strength and safety, There is a choice of 3 compartment depths and from 1-6 compartments per unit with a choice of locking options. These Probe Clear Door Lockers have transparent but tough polycarbonate doors. They reduce shrinkage and theft in the workplace..
Where can you use a laptop locker? Read this article to find out.